Health care organizations from around the state of Florida came together on Mayo Clinic’s Jacksonville campus Aug. 29 to raise awareness about clinical trials research taking place in the state. The Florida Policy Forum on Clinical Trials also focused on strategies for recruiting more diverse participants and the important role clinical trials play in providing improved treatment options for patients. Dr. Patel opened the program in Kinne Auditorium with welcoming remarks to about 100 people in the audience, consisting of major cancer centers and health systems in Florida, state government and policy makers, patient advocacy organizations and consumers. Florida State Representative Jason Brodeur (House District 28), chair of the House Health Care Appropriations Subcommittee, served on one of the panels, explaining how the state of Florida funds clinical trials. 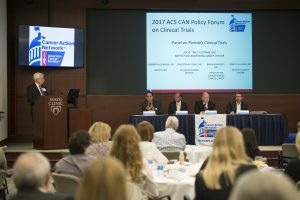 Panel discussions included a focus on the importance of clinical trials and how to close the disparity gap, as well as the future of cancer clinical trials. Asher A.Chanan-Khan, M.D., chair of Hematology/Oncology, and Sikander Ailawadhi, M.D., vice chair, clinical practice, Hematology/Oncology, represented Mayo on the panels. Dr. Ailawadhi emphasized that more can be done to provide patients the access they need to clinical trials. He told the audience that Mayo Clinic is working to develop clinical trial pathways for clinicians so that “clinicians can decide when patients walk in the door, what clinical trial they are eligible for. As long as patients get the right treatment at the right time, we can make a difference.” He stated that he believes clinical trials should become the standard for cancer care across the country. That comment earned him applause. Dr. Chanan-Khan commented that “we’ve developed an extensive resource and infrastructure on campus for novel clinical trials” at Mayo Clinic. “We look at the science first and bring it to the patient.” He called for action in seeking legislative solutions to remove financial barriers so that every patient could have access to clinical trials. The event was hosted by the American Cancer Society Cancer Action Network. Other participating health care organizations included Moffitt Cancer Center; UF Health Shands Hospital; Baptist MD Anderson Cancer Center; University of Miami Sylvester Comprehensive Cancer Center; 21st Century Oncology, UF Oncology and Infusion Center; and PhRMA. Find out more about clinical trials on Mayo's clinical trials website.